Objective: To investigate the impact of Angelica on promoting juvenile rat fracture healing and Bone Marrow Stem Cells (BMSCs) proliferation. Patients and Methods: A total of 30 juvenile rats were selected to establish bilateral tibia fracture model and then randomly divided into Angelica group and the control. The rats in Angelica group were fixed with plaster and received Angelica lavage every day. X-ray was used to observe tibia fracture. Bone Morphogenetic Protein 2 (BMP-2) expression at the fracture was tested by in situ hybridization. BMSCs were separated upon density gradient method and divided into Angelica group and the control group. Cell proliferation was evaluated by MTT assay. Supernatant VEGF protein concentration was detected by ELSIA assay. Results: At the first week after modeling, callus formation was found in Angelica group but not control. At the second week, the fracture in Angelica group was completely filled by callus. At the fourth week, the fracture exhibited cortical bone reconstruction and the medullary cavity recanalization in Angelica group. X-ray macroscopic observation score in Angelica group was higher than control. BMP-2 mRNA level significantly increased in Angelica group compared with control. In addition, BMSCs proliferation in Angelica group was obviously higher than that in control. VEGF protein concentration in the supernatant markedly elevated in Angelica group compared with control. Conclusions: Angelica can facilitate juvenile rat fracture healing by stimulating BMSCs proliferation and upregulating VEGF protein expression. Though child fracture is not common, it can cause fracture healing delay. It is the main cause of disability and death that seriously affects the quality of life [1,2]. Therefore, its prevention and treatment draw more and more attention. There are serious limitations of current therapy in clinical application, and the long-term prognosis is still not very satisfied . In recent years, child fracture treatment upon stem cells became the hotspot in medicine and biology . Bone Marrow Stem Cells (BMSCs) became the focus of attention in basic research and clinical treatment because of its easily acquisition and large amount. BMSCs are featured as active differentiation and proliferation, and form osteoblasts in the fracture site. However, the time needed of their differentiation into osteoblasts seriously affected the timely healing of child fracture . How to accelerate BMSCs differentiation into osteoblast is an urgent problem need to be solved. Following the development of traditional Chinese medicine research, more and more results showed that traditional Chinese medicine has great potential in the treatment of child fracture. Modern pharmacology study found that some traditional Chinese medicines can regulate related cytokines, including interleukins, Tumor Necrosis Factor (TNF), Colony Stimulating Factors (CSFs), induce B cells to produce antibodies, enhance Vascular Endothelial Growth Factor (VEGF) expression, increase the number of the blood vessel cells regeneration factor, and promote angiogenesis [6,7]. Therefore, it is necessary to investigate the role of traditional Chinese medicine in child fracture. Angelica is an umbrelliferae plant containing a large amount of amino acids and microelements. Modern pharmacology study showed that Angelica was effective in anti-oxidation and improving immune function. Recent research demonstrated that the main effective components of Angelica can promote BMSCs proliferation and vascular endothelial growth factor production [8-10]. This study intends to discuss the effect of Angelica in facilitating juvenile rat fracture healing and bone marrow stem cells proliferation, aiming to provide theoretical basis for the application of Angelica in child fracture treatment. Angelica decoction was prepared by traditional method. The Angelica at 1 g/ml was filtered, regulated at pH=7.0~7.4, and stored in 4°C. DMEM medium was from Gibco. FBS was from Hyclone. MTT and trypsin were got from Sigma. VEGF ELISA kit was from Shanghai Zhuokang biological technology co., LTD. VEGF primary antibody was from Santa Cruz. The rats were purchased from Shandong University West China Center of Medical Sciences. The rats were anesthetized by 3% pentobarbital sodium intraperitoneal injection at 30 mg/kg. The posterior limb was disinfected by iodine and incised on the dorsal of middle tibia for 2 cm. Then the skin and subcutaneous tissue were separated to expose the tibia. Tibia fracture was made by rongeur avoid of damaging blood vessels and nerves. Penicillin was intramuscular injected at 400,000 IU/d for three days after surgery to prevent infection. The rats in Angelica group received 5 ml Angelica decoction (1 g/ml) lavage every day, whereas the rats in control received normal saline lavage. Rats were used for all experiments, and all procedures were approved by the Animal Ethics Committee of Jining No.1 People’s Hospital. After killed by intraperitoneal injection of chloral hydrate, the rats received X-ray photographing of tibia lateral projection to observe fracture healing, osteotylus quantity, and bone trabecula. Osteotylus quantity, osteotylus density, fracture site, and osteotylus edge were evaluated and scored. Specially, callus shadow accounted for 0-25% of defect, clear fracture line, and no plastotype were treated as 1 point. Callus shadow accounted for 25-50% of defect, blurred fracture line, and medullary cavity formation were defined as 2 points. Callus shadow accounted for 50-75% of defect, significant blurred fracture line, and cortical bone shape were set as 3 points. Callus shadow accounted for over 75% of the defect, disappeared fracture line, and complete connection nearly ossification were considered as 4 points. A total of 10 juvenile rats were killed to extract posterior limbs. The marrow cavity of thighbone and tibia was opened and flushed by DMEM medium containing 10% FBS. The bone marrow suspension was added to the 10 ml centrifuge tube containing bandicoot percoll with density at 1.094. BMSCs were separated by density gradient method and cultured in complete medium at 37°C and 5% CO2. After 48 h, the medium was changed every other day. BMSCs in control were maintained in medium containing 15% FBS. The cells in Angelica group were treated by Angelica at 1.0 mg/L, 2.0 mg/L, and 5.0 mg/L, respectively. The cells in logarithmic phase were digested and seeded in 96- well plate at 5 × 103 cells/well. The cells were treated by 100 μl Angelica at different concentrations for 72 h. Next, the plate was added with MTT at 5 mg/ml for 4 h. After treated by 150 μl DMSO, the plate was measured on microplate reader. The plate was added with standard substance or sample at 50 μl. After incubated at 37°C for 30 min, the plate was washed by washing buffer and treated by working liquid at 50 μl at 37°C for 30 min. Next, the plate was added with 50 μl color agent A and B at 37°C for 15 min. At last, the plate was treated by 50 μl stop buffer and measured at 450 nm. The linear regression equation was drawn based on the concentration of standard substance to calculate the sample concentration. The tissue sample was treated by dewaxing and hydration. After washed by PBS for 5 min and inactivated by 3% H2O2 for 10 min, the tissue was fixed by 1% paraformaldehyde for 10 min. Next, the slice was incubated with 20 μl hybridization solution at 38-42°C overnight. Then the slice was further incubated in 2 × SSC for 15 min for twice, 0.5 × SSC for 15 min for twice, and 0.2 × SSC for 15 min for twice. After blocked at 37°C for 30 min, the slice was added with biotinylated rabbit digoxin at 37°C for 120 min. At last, the slice was developed by DAB for 30 min and analysed by Leica Qwin Pro system. The statistical analysis was performed on SPSS 17.0 software. Each experiment was repeated for three times. Measurement data was depicted as ͞x ± s, while enumeration data was compared by chi-square test. Multivariate analysis was applied using binary Logistic regression analysis. P<0.05 was considered as statistical significance. The rats in each group can walk using anterior limb after anesthetic awareness. They showed free activities and normal feeding and drinking in cage on the 1st day after surgery. No rats exhibited wound swelling or weeping. At the first week after modeling, blurred fracture, clouding shadow, and little callus formation were found in Angelica group. No callus formation was observed in control. At the second week, the rats in Angelica group demonstrated fracture completely filled by callus and a large amount of external callus formation. Soft callus was found filled in fracture but no external callus in control. At the fourth week, the fracture exhibited cortical bone reconstruction and the medullary cavity recanalization in Angelica group. It was found fracture was filled with callus and closed medullary cavity. X-ray macroscopic observation score in Angelica group was significantly higher than control (P<0.05) (Figures 1 and 2). Figure 1: X-ray comparison between angelica group and control on the 4th week after surgery. Figure 2: X-ray grading comparison between angelica group and control on the 1st, 2nd, and 4th w after surgery. *P<0.05, compared with control. Fibrous callus appeared and BMP-2 mRNA elevated in Angelica group at the first week, while BMP-2 mRNA also expressed in the mature chondrocytes of external callus. No callus and significant positive staining in fibroblasts were found in control. BMP-2 mRNA was found largely expressed in osteoblasts, bone cells, cartilage matrix, and mesenchymal cells from Angelica group, whereas it was weakly positively expressed in chondrocytes and osteoblasts from control at the second week after modeling. At the fourth week after operation, the positive cell number and range markedly declined, and the trabecular bone arranged densely. The positive staining of BMP-2 in Angelica group at the 1st and 2nd weeks was obviously stronger than that in control (Figure 3, Table 1). Table 1. BMP-2 in situ hybridization comparison. Figure 3: BMP-2 in situ hybridization in angelica group and control at the second week after surgery. The absorbance value of BMSCs treated by different concentrations of Angelica (1.0 mg/L, 2.0 mg/L, and 5.0 mg/L, respectively) was 0.20 ± 0.005, 0.45 ± 0.007, and 0.71 ± 0.01. It was significantly higher than that in control as 0.07 ± 0.002 with dose dependence (P<0.05) (Figure 4). 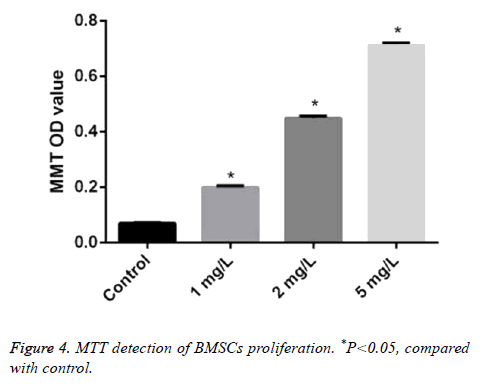 Figure 4: MTT detection of BMSCs proliferation. *P<0.05, compared with control. The concentration of VEGF treated by different concentrations of Angelica (1.0 mg/L, 2.0 mg/L, and 5.0 mg/L, respectively) was 490.20 ± 90.05, 604.50 ± 90.07, and 707.10 ± 90.01μg/L. It was markeldy higher than that in control as 320.17 ± 40.02 μg/L with dose dependence (P<0.05) (Figure 5). Figure 5: VEGF concentration comparison. *P<0.05, compared with control. Child fractures is not common, however, its occurrence will cause fracture healing delay. As the main cause of disability and death in child fracture, fracture healing delay seriously affected the quality of life and long-term prognosis. At present, there is still lack of ideal treatment for child fracture. Angelica, as a Chinese medicine, is an important drug for tonifying Qi, blood replenishment, and blood activation. It often cooperates with other drugs in the treatment of lingering pathogen due to deficient vital qi and double deficient. Modern pharmacology study showed that Angelica has the effect of enhancing immunity, improving microcirculation, inhibiting platelet activity, and reducing the inflammatory response of vascular endothelium cells [8-10]. Traditional Chinese medicine theory considered that "bone cannot connect without live blood". Thus, promoting qi to activate blood is an important aspect for fracture treatment. It was revealed that the drug replenish the blood can obviously increase the number and diameter of capillary near the fracture site and improve microcirculation to promote fracture healing. BMP is a type of growth factor with a variety of functions. BMP-2 is composed of two peptides, including the 147 amino acids. One of the main biological activities of BMP-2 is to regulate embryonic development and induce osteogenesis . In addition, BMP-2 can affect the fracture repair ability . Since the most important biological activity of BMP-2 is to induce osteogenesis , it can induce undifferentiated mesenchymal stem cells to differentiate into chondrocytes, further forming cartilage, and eventually mineralizing to bone tissue. Finally, it can induce osteogenesis through entochondrostosis [14,15]. Our results showed that the rats received Angelica lavage had callus formation at the first week after operation. At the second week, the fracture was completely filled by callus. At the fourth week, the fracture exhibited cortical bone reconstruction and the medullary cavity recanalization. In addition, in situ hybridization demonstrated that BMP-2 mRNA expression in Angelica group was obviously higher than that of control, suggesting that Angelica can obviously elevate BMP-2 expression in the fracture site of the juvenile rats. Xu et al. reported that Angelica significantly increased BMP-2 mRNA expression in BMSCs with dose and time dependence. Moreover, such effect was accomplished through Transforming Growth Factor-β (TGF-β) . In recent years, the function of BMSCs provided new clue and idea for the treatment of child fracture. BMSCs can differentiate into various tissue cells under specific condition, especially osteoblasts. Therefore, its role in fracture healing received more and more attention and research [17,18]. Tang et al. separated and BMSCs in vitro and treated them using different concentrations of Angelica decoction for 24 h. They further used digoxin labeled rat TGF-β1 cDNA probe to perform in situ hybridization analysis of BMSCs with the average cell hybridization positive particles OID value as TGF- β1 expression. The results showed that BMSCs proliferation obviously enhanced, while TGF-β1 level also upregulated following the increase of Angelica concentration, indicating that Angelica can stimulate BMSCs proliferation through upregulating TGF-β1 . Our results demonstrated that Angelica treatment markedly increased BMSCs proliferation with dose dependence. VEGF molecule is a dimer made up of two identical polypeptides through disulfide bond. There are seven members in the family and all have the ability to induce endothelial cell proliferation. VEGF plays an important role in the process of fracture healing. It was found that VEGF highly expressed in the mesenchymal stem cells at fracture site and participated in the repair of osteoblasts and chondrocytes. Moreover, VEGF can stimulate endothelial cell differentiation and proliferation together with bFGF, thus accelerating cartilage calcification and bone reconstruction [20-22]. Street et al. found in animal model that local application of VEGF in rat femur fracture can promote the fracture healing and bone formation . Peng et al. also revealed that exogenous VEGF can accelerate fracture healing and bone formation . Muschler et al. confirmed in the animal experiments that VEGF can activate BMSCs to proliferation and differentiation to the desired direction, which is beneficial to fracture healing . Gao et al. discovered that Angelica decoction used on New Zealand white rabbit with bilateral upper radius fractures can obviously increase the content of VEGF in serum and fracture site. This effect is associated with Angelica stimulates callus tissue secreting BMP . This study presented that compared with control, BMSCs proliferation elevated in Angelica group with dose dependence. Furthermore, VEGF concentration in supernatant from Angelica group significantly upregulated with dose dependence. It suggested that Angelica could promote BMSCs proliferation and VEGF expression, which may be a mechanism of Angelica promoting juvenile rat fracture healing. Angelica can significantly promote juvenile rats fracture healing through stimulating BMSCs proliferation and enhancing VEGF protein expression. Williams KM. Update on Bone Health in Pediatric Chronic Disease. Endocrinol Metab Clin North Am 2016; 45: 433-441. Carey DE, Golden NH. Bone Health in Adolescence. Adolesc Med State Art Rev 2015; 26: 291-325. Ghadakzadeh S, Mekhail M, Aoude A, Hamdy R, Tabrizian M. Small Players Ruling the Hard Game: siRNA in Bone Regeneration. J Bone Miner Res 2016; 31: 475-487. Servaes S, Brown SD, Choudhary AK, Christian CW, Done SL, Hayes LL, Levine MA, Moreno JA, Palusci VJ, Shore RM, Slovis TL. The etiology and significance of fractures in infants and young children: a critical multidisciplinary review. Pediatr Radiol 2016; 46: 591-600. Kaya M, Yaldiz C, Ceylan D. Malgaigne Fracture in Childhood: A Case Report and Review of Literature. Medicine (Baltimore) 2016; 95: e2521. Yang Y, Chin A, Zhang L, Lu J, Wong RW. The role of traditional Chinese medicines in osteogenesis and angiogenesis. Phytother Res 2014; 28: 1-8. Li M, Zhang ND, Wang Y, Han T, Jiang YP, Rahman K, Qin LP, Xin HL, Zhang QY. Coordinate regulatory osteogenesis effects of icariin, timosaponin B II and ferulic acid from traditional Chinese medicine formulas on UMR-106 osteoblastic cells and osteoblasts in neonatal rat calvaria cultures. J Ethnopharmacol 2016; 185: 120-131. Wang X, Zheng T, Kang JH, Li H, Cho H, Jeon R, Ryu JH, Yim M. Decursin from Angelica gigas suppresses RANKL-induced osteoclast formation and bone loss. Eur J Pharmacol 2016; 774: 34-42. Ahn SJ, Baek JM, Cheon YH, Park SH, Lee MS, Oh J, Kim JY. The inhibitory effect of angelica tenuissima water extract on receptor activator of nuclear factor-kappa-b ligand-induced osteoclast differentiation and bone resorbing activity of mature osteoclasts. Am J Chin Med 2015; 43: 715-729. Lai P, Liu Y. Angelica sinensis polysaccharides inhibit endothelial progenitor cell senescence through the reduction of oxidative stress and activation of the Akt/hTERT pathway. Pharm Biol 2015; 53: 1842-1849. Hough FS, Pierroz DD, Cooper C, Ferrari SL, Bone IC, Diabetes Working Group. Mechanisms in endocrinology: mechanisms and evaluation of bone fragility in type 1 diabetes mellitus. Eur J Endocrinol 2016; 174: 127-138. Händel MN, Heitmann BL, Abrahamsen B. Nutrient and food intakes in early life and risk of childhood fractures: a systematic review and meta-analysis. Am J Clin Nutr 2015; 102: 1182-1195. Forestier-Zhang L, Bishop N. Bone strength in children: understanding basic bone biomechanics. Arch Dis Child Educ Pract Ed 2016; 101: 2-7. Harrington J, Sochett E. The child with multiple fractures, what next? Pediatr Clin North Am 2015; 62: 841-855. Fratzl-Zelman N, Misof BM, Klaushofer K, Roschger P. Bone mass and mineralization in osteogenesis imperfecta. Wien Med Wochenschr 2015; 165: 271-277. Xu R ZY, Fu C. Histochemical Salvia Injection on chick embryo cell culture growth isolated frontal impacts to observe development and maturation of bone-like cells. Chinese J Orthop 2014; 14: 185. Reid IR. What diseases are causally linked to vitamin D deficiency? Arch Dis Child 2016; 101: 185-189. Blann A. An update on vitamin D deficiency and at risk groups. J Fam Health 2015; 25: 16-19. Tang GSL, Tu Y. Bushen huoxue recipe bone cell growth factor TGF-β1 M-RNA expression. Chinese J Trad Med Traumatol 2009; 7: 5. Pickett TA. The challenges of accurately estimating time of long bone injury in children. J Forensic Leg Med 2015; 33: 105-110. Saraff V, Hogler W. Endocrinology and adolescence: osteoporosis in children: diagnosis and management. Eur J Endocrinol 2015; 173: 185-197. Farr JN, Khosla S. Skeletal changes through the lifespan--from growth to senescence. Nat Rev Endocrinol 2015; 11: 513-521. Street J, Bao M, deGuzman L, Bunting S, Peale FV, Ferrara N, Steinmetz H, Hoeffel J, Cleland JL, Daugherty A, van Bruggen N, Redmond HP, Carano RA, Filvaroff EH. Vascular endothelial growth factor stimulates bone repair by promoting angiogenesis and bone turnover. Proc Natl Acad Sci USA 2002; 99: 9656-9661. Peng H, Wright V, Usas A, Gearhart B, Shen HC, Cummins J, Huard J. Synergistic enhancement of bone formation and healing by stem cell-expressed VEGF and bone morphogenetic protein-4. J Clin Invest 2002; 110: 751-759. Muschler GF, Nakamoto C, Griffith LG. Engineering principles of clinical cell-based tissue engineering. J Bone Joint Surg Am 2004; 86-86A: 1541-1558. Gao Y HH. Chinese medicine compound promotes fracture healing in rats. Sci Technol Eng 2007; 7: 1164-1166.